Installing fiber optic cable can be an expensive and lengthy process. Often, it requires an extended period of right-of-way negotiations and acquisitions before a company starts to dig. Plus, there’s a costly and disruptive construction process that must take place before the lines are secure and buried. A common practice with fiber is to bury excessive cables while field crews are already underground, so that they won’t have to dig again. Over the years, many companies installing fiber have adopted this process. This blog post will explain dark fiber in detail—discussing 3 advantages and 3 disadvantages. It will also look into what the future holds for dark fiber. The simple definition of dark fiber is fiber optic infrastructure that is unused or unlit. Since fiber optic cables move data by pulses of light transmitted through them, completely unused fiber is—in every sense of the word—dark. But because of fiber’s high capacity, the common definition of dark fiber has been stretched in recent years to include fiber infrastructure that may already be under lease, but has capacity to accommodate additional users. A technology known as dense wavelength division multiplexing (DWDM) permits multiple users to transmit through a single fiber cable, without the signals interfering with one another. 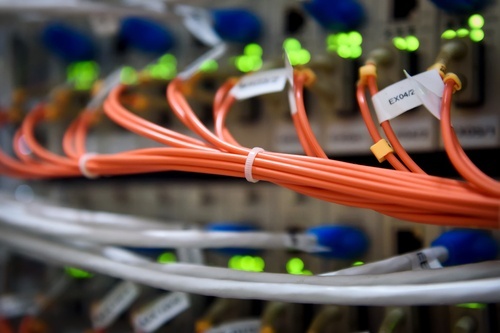 Depending on various needs, one fiber optic cable can serve several users at a time. Perhaps the most important word in an explanation of dark fiber is potential. Dark fiber is dormant, but it’s right there beneath the surface, ready to be used. Some companies that own a lot of dark fiber have decided they might as well be making money on it, so they rent it to other companies that need the bandwidth. Lit fiber offers superior bandwidth, greater security, and less signal loss over long distances than other options. It has a large capacity and therefore can give the companies using it plenty of room for growth. Dark fiber gives companies the advantage to deploy services quickly because its already in the ground. There are significant setup costs, but fiber’s durability, quality, and capacity produce savings over time. Laying more fiber than needed in the ground is an advantage in the long run. The company leasing the fiber sets up transmission equipment to its own specifications, meeting its own needs. When low latency is crucial to success, this can be important. And when there’s a problem, the owning-company has their own maintenance technicians to address issues immediately. Some cities have extensive dark fiber in place; others don’t. If the infrastructure is not routed where it’s most needed, then the case for dark fiber is lost. With any infrastructure, issues will arise. The problem with dark fiber is that its unseen and unused, so if something goes wrong its incredibly difficult to catch. Major problems, if they occur, can be expensive to fix, especially if they exceed the abilities of an in-house maintenance team. For some telecos, dark fiber in the neighborhood will mean unwanted competitors. Where substantial dark fiber exists, it provides an opportunity for smaller companies that may not be able to install their own fiber. If the asset owner isn’t keeping a watchful eye on their dark fiber, other deploying companies may occupy it without authorization. Damage and violations may also occur. Has the fiber’s owner done a recent cable test? Are the results available? Not all dark fiber is created equal. A test can pinpoint signal loss and capacity issues. It’s good to have an alternate data path to keep traffic moving in case a problem arises with the primary fiber in use. An optical-network monitoring system can spot potential problems in the network before they become major issues. What Does Dark Fiber Mean for Joint Use? Dark fiber is a big benefit for telecommunications companies, but it requires joint use interactions with the owning company. New implementations of dark fiber (especially over the next few years) will coincide with the complexity of joint use issues related to deployment of small cell and new fiber. Dark fiber isn’t going to stay dark forever. Smaller companies are interested in tapping into dark fiber’s potential. Joint use professionals are turning the light on, from asset owners to lessees, and all will be better off if every joint use party works together smoothly and efficiently. As the joint industry embarks on changing times, many owners and attaching companies are turning to a centralized joint use platform to remedy their challenges. Alden provides a platform and consultation services for our clients. Our mission is to create better communities through better infrastructure, and we do that through our software and services. We walk with our clients every step of the way to ensure their joint use processes are automated, simple, and easy. With such fast-paced changing times, we want to safeguard our clients into straightforward processes that get the job done. From permitting to deployment, maintenance of existing assets and turning on dark fiber, Alden is here to help. Does your company own dark fiber, or is dark fiber available in areas served by your company? Have you taken advantage of it, or do you expect to do so in the coming years? Let’s talk in the comments below.